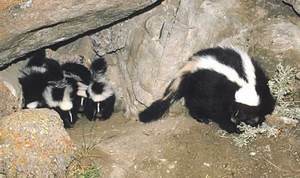 Tigard Skunk Removal is a common problem we deal with and one of the easiest to identify because of the strong smell. We are able to remove the problem skunk's along with deodorize areas that have strong odor. Trapping skunks can be very tricky if you do not know what you are doing and the chance of getting sprayed increase without the right equipment. Over many years we have been dealing with skunks we have found different methods to prevent spraying. We also provide exclusion services which will prevent skunk's from getting under your house, deck or shed. That is were the real problem is and is a very important step in the process. If you just trap and remove the skunks from Tigard, but leave the area unsealed there is a good chance other critters or pests will get in. Tigard Skunk Control and Removal Call 503-201-2432!